After a few weeks of very cold weather, we got into the 50's today. I took a drive and ended up at a park north of Des Moines called Jester Park. 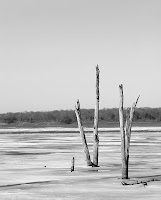 It has access roads to Des Moines River which is where I came upon these dead trees sticking out of the ice. I thought they were pretty cool looking so here's my shot for this week. This part of the river and park is part of the Saylorville Reservoir Recreation area. This shot doesn't hint to it, but, it's quite large. In warmer weather this is where you'll find people enjoying a day boating, fishing or laying out on the "beach". Well, Iowa's version of a beach. Not this day, though. While WAY warmer than it has been, today all I found of interest were these trees. This is also a first experiment using Adobe Lightroom. I must say I'm impressed, especially with b&w conversion. It's like channel mixing on steroids. I'm using the 30 day trial while trying to convince myself to make a purchase before the $100 off "new product" special is over in a few days. I'm almost convinced. I really like this. The patterns on the ice add a lot. Simple yet interesting. This is a great picture... just superb. I'm with Elaine... a simple image that has interesting features and lines. I'm completely sold on Lightroom. It helps a little that I'm one of the fortunate RSP owners given a complimentary copy - BUT I would definetly have paid full whack for it. Wow! The b&w is great for this. I hope viewers open the large image, because it is soooo much better than the little one. The toning and light is great. I love the simplicity and the serene feel of this shot. The black and white conversion is spot on, I'd better go check out Lightroom. This photo screams "spring thaw" to me. The ice looks soft, as if it couldn't support a ten pound weight. The bare trunks give good textural detail. To me, this image reflects the isolation/harshness that winter can sometimes have. Nice B&W! Less really is more in the shot. The dead trees and relatively barren landscape exude isolation. The B&W toning is done amazingly well.